Beware, there’s another company trying to steal your business and wanting to renew your domain name for outrageous prices! I received this email from sender@m1.finaldomainnotices.com saying it was my final notice. Finaldomainnotices.com is not my domain provider, and they should not be yours. These guys send an official looking email that seems urgent that you may lose your domain name. They want to renew it for you for $75 a year! (my provider charges less than a third of that and there are cheap places that will do it for even less). 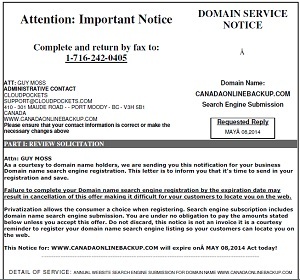 The subject of my email is: Domain Notification: GUY MOSS This is your Final Notice of Domain Listing – CANADAONLINEBACKUP.COM. This company is following along the lines of “Domain Registry of Canada” who do much the same but actually send you a notice and an envelope – physical mail. They are both deceptive practices trying to steal you away from your legitimate domain registrar. Most of us don’t really pay much attention to who we’re registered with (I use Cloudpockets.com) so it’s easy to respond, thinking that you missed something. Don’t react to this offer and send or fax anything. A quick research shows this domain was registered April 16, 2014. Try going to www.finaldomainnotices.com – it showed a blank page when I tried. This is new, very new, probably newer than your website is! If you have any questions about your domain contact YOUR domain provider. 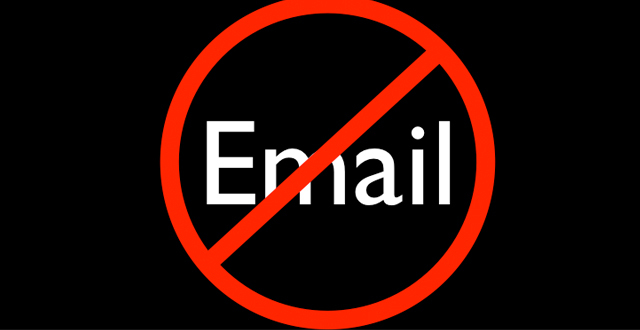 You can also forward the email to abuse@enom.com to complain about this. Privacy: What Does Your Telco Know About You? 8 Comments on "Finaldomainnotices.com – Scam"
My web design client also received this email and, luckily, asked me if it was a scam. I’m in Britain and have also received 2 emails from them. Also got two mails today from sender@m1.finaldomainnotices.com. I’m french, they surely target the world. The expiration domaine date from the mail was different from the real expiration date. Was a good hint to spot the scam. Also usually my domain names are auto-renew. Mikie, you’re in England I presume, I’m Canada, they are sure targeting the world. Statistically some will respond. It’s a terrible way to do business. I received this email from sender@m1.finaldomainnotices.com too. Finaldomainnotices.com is not my domain provider,and they should not be yours.